Kaido iwai no aka Archives - Kampai! : Kampai! Posts tagged with "Kaido iwai no aka"
Kannoko is a single distilled normal pressure mugi shochu aged in oak barrels for 3 years before bottling. 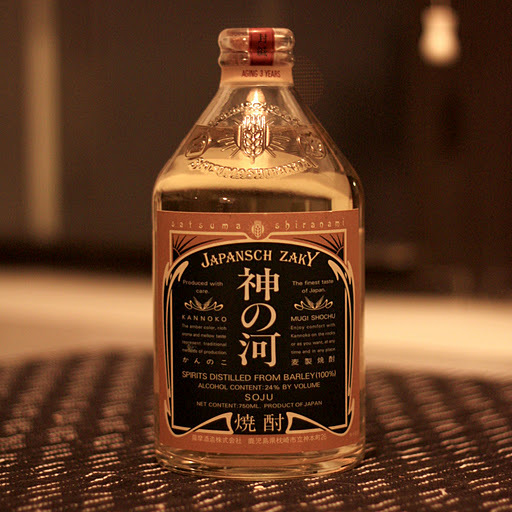 The oak gives the shochu its rich golden color and its faintly whiskey flavor. This is one of those aged mugis that whiskey drinkers will find familiar. Tombo is the only honkaku (single distilled) shochu I know of that is not produced in Japan. It's also the only honkaku shochu, to my knowledge, made with North American barley. At $14.99 at my local liquor store no other honkaku shochu comes close to the price point. But don't let the nontraditional location or grain put you off. This is an authentic shochu. 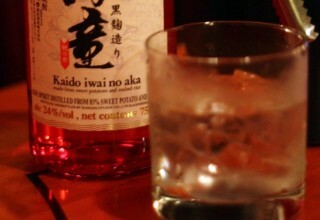 If you're lucky enough to find a bottle of Kawabe in New York, grab it and enjoy. It's been consistently out of stock at every liquor store and izakaya that carries it due to unexpected demand thanks to capturing the attention of several prominent izakaya bartenders and their customers. Some bar have resorted to shipping cases from California to assure uninterrupted supply. Kuratake surprised me as soon as I opened the bottle. The rich sweet potato aroma and flavor I expect from imo shochus is largely absent from this spirit until you pay attention. It's got a subtle presence, but not the overwhelming sensation you'll get from a traditional Kagoshima style black koji imo shochu like Shiranami Kuro. This shochu takes the experience in a completely different direction.